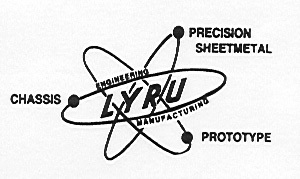 Our mission is to "meet or exceed customer requirements", this is the principal that LYRU has lived up to throughout its 42-year history. We at LYRU take pride in our precise attention to detail in our metal fabrication, and close tolerance metal fabrication services. We create and foster long-term relationships with our vendors. We align our selves with leading manufactures and actively promote their visibility and success. We keep the terms we agree to. We are proud to be in the position of leadership and are determined to maintain it by being innovators in the future.